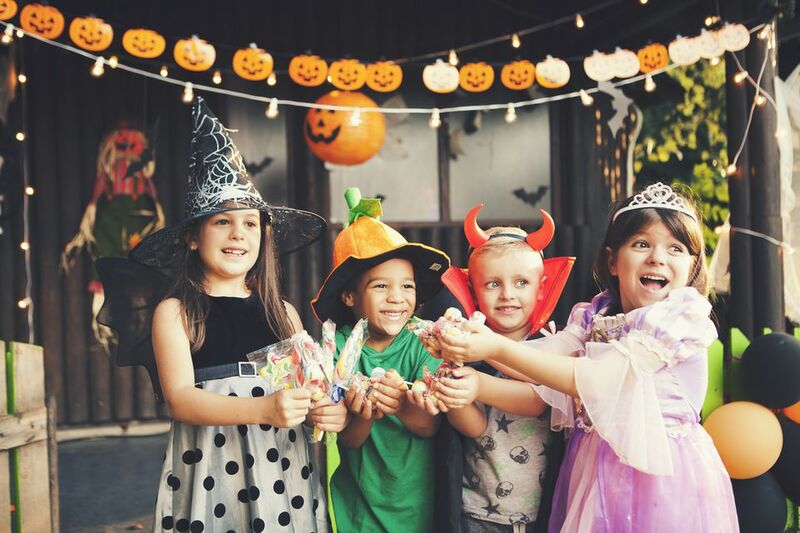 Whenever you bring a group of kids together for a party, it's a smart strategy to have a few organized games planned, but especially at Halloween when everyone is revved up from the excitement and candy. These games will work at both home and classroom parties. Just be sure to consider the ages of the children when you select the suitability of the games. Then go ahead and have a howling good time! We've often used this game in classroom parties, and it's always a hit. Divide the children into groups of three to five kids. Select one child in each group to be a mummy. Then give the other children a roll of toilet paper or crepe paper. Instruct them to wrap the mummy with the paper, leaving the eyes, nose, and mouth uncovered. The first group to be done with their roll of paper wins. Play Halloween party music or creepy sound effects and tell the children to dance. When you turn off the music, they all need to freeze. Whoever is caught moving during the freeze is out of the game. The last person dancing wins. For a fun variation on this game, tell the children they will need to pose in the Halloween shape you will have called out during the previous freeze. Some fun shapes could be: black cat; pumpkin; broomstick; mummy; bat; etc. Tell all the children to lie still on the floor like a zombie. Select one child to be "it". That child's job is to make the other children laugh. "It" can make funny faces, dance, act silly, whatever inspires him or her. Once a "zombie" laughs, he or she can join "it" in attempting to make the group laugh. Whoever holds out the longest without laughing is the winner. This game is a variation on "hot potato". Seat the kids on the floor in a circle. Give them a small pumpkin to pass around. Play Halloween party music as they pass the pumpkin, and periodically stop the music. Whoever is holding the pumpkin is out. The game continues until one person is left with the pumpkin. Tack a large cardboard pumpkin to a wall. In turn, blindfold each child and give them a black cutout shape of a nose with double-sided tape on the back. Have them walk up to the wall and pin the nose on the pumpkin. In turn, each child begins by saying "I went trick or treating and I collected...", and then in alphabetical order, each child adds to the list. Naturally, each subsequent child needs to add to the list and repeat the letters prior to his or her turn. For example, the third child might say, "I collected C - a cat; B - a Bat; A an apple. Friends can help with this game, otherwise, it wouldn't be fair to the last person. Create a Halloween story that repeatedly uses the words "left" and "right". For example, "On Halloween night, Susie left for trick or treating. Right away she ran into her friend Billy as she made a right turn at the corner. He was holding his trick or treat bag in his right hand." At your party, have the children sit in a circle and give one of them a pumpkin. As you read the story, they need to pass the pumpkin to the person seated next to them as the words left or right are spoken. Read the story quickly and watch them giggle as they try to keep up with the directions. Carve out a large pumpkin, making a wide opening at the top. Give each child a handful of pennies. Have them stand an appropriate distance from the pumpkin and try to toss the pennies in, one at a time. For each successful toss, give the child a small piece of Halloween candy.